For someone who is not handy with electronics, a sound advice is to consider the front wheel drive conversion kit. 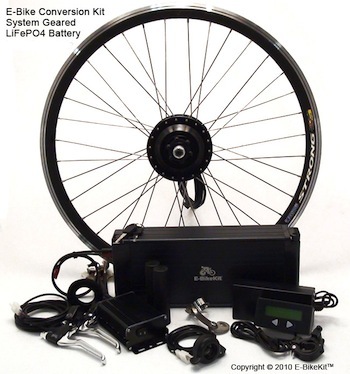 The advantage of a kit with a front wheel drive is that it is quite easy to install. You don't have to adjust the derailleur, and It also can be easily removed if you want to ride your “normal” bike again. There are more advantages to this kind of kit as well as some drawbacks. To read about the pros and cons of the front wheel drive, click here. Before buying this kind of kit, make sure that the front fork and dropouts are wide enough to fit the motor. Different kits from different companies may have different requirements. If the new front wheel is not suit perfectly to the dropout width, it is sometimes still possible to fit it it in. You would just need to make the slots a little wider. Also, in the case of high power front motors, the front fork should be made from steel and not alumina, because the alumina can't withstand high pressures over long periods. The motor is just too powerful for an aluminum fork and can bend or even break the drop-outs. You can easily check whether the front fork of your bicycle is make from steel or alumina. Attach a magnet to the fork. If the magnet isn't attracted, the fork is made from alumina. Turn the bike upside down and let the air out of the tire. Loose the brake cables to remove the wheel from the fork. Remove the original front wheel. Move the tire and/or tube from the old wheel to the new wheel if necessary. If the tire and/or tube are cracked or damaged in any way, it is probably a good opportunity to get new ones. Inflate the tire pressure a little and check that the tire is evenly fitted around the rim. Inflate more pressure and double-check the balance. Inflate to the maximum pressure specified on the sidewall of the tire.